Eli "Lucky" Thompson (June 16, 1924, Columbia, South Carolina — July 30, 2005, Seattle, Washington) was a United States jazz tenor and soprano saxophonist. He is considered, alongside Steve Lacy, to have brought the soprano saxophone out of obsolescence, playing it in a more advanced bebop format, which inspired John Coltrane to take it up in the early 1960s. After playing with the swing orchestras of Lionel Hampton, Don Redman, Billy Eckstine, Lucky Millinder, and Count Basie, he worked in rhythm and blues and then established a career in bop and hard bop, working with Kenny Clarke, Miles Davis, Dizzy Gillespie and Milt Jackson. Thompson was an inspired soloist capable of a very personal style in which the tradition of Coleman Hawkins, Ben Webster and Don Byas was intelligently mixed with a modern grasp of harmony. He showed these capabilities as sideman on many albums recorded during the mid-1950s, such as Stan Kenton's Cuban Fire, and those under his own name. He appeared on Charlie Parker's Los Angeles Dial Records sessions and on Miles Davis’s hard bop Walkin' session. 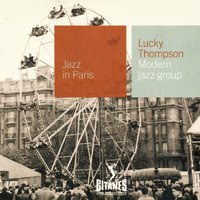 Thompson recorded albums as leader for ABC Paramount and Prestige and as a sideman on records for Savoy Records with Milt Jackson as leader. He lived in Lausanne, Switzerland in the late 1960s and recorded several albums there including A Lucky Songbook in Europe. He taught at Dartmouth College in 1973 and 1974, then left the music business completely, because of the racist treatment he received from record companies and clubs. In his last years he lived in the Pacific Northwest and suffered from Alzheimer’s disease.